In addition to the release based method demonstrated below. I created a SQL Agent job based method using dbatools here. This method was created in response to a lot of feedback from DBAs like you. After we create a strategy for synchronizing our data for disaster recovery, we then need to consider keeping our server objects synchronized. Depending upon which objects you are working with there are various solutions available to you. xp_help_revlogin (2005 and below, 2008 and higher) is a MS created, T-SQL based, solution for moving logins while persisting SIDs and passwords without the DBA having the know the passwords in advance. SSIS Transfer Logins Task is an SSIS based version of xp_help_revlogin but it doesn’t retain the SQL account passwords for you. 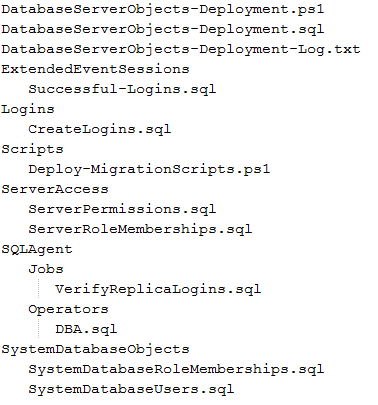 For a more complete solution, including objects like linked server, check out this SSIS / C# solution on MSSQLTips, here. Phil Factor has provided us with a PowerShell solution which I prefer, if you do not have input into your deployment processes or if a lot of ad hoc scripts and configurations end up in production. All of these options have their merits and I have personally used the last bullet for many servers in the past. However, I prefer to keep all of the server objects in sync at deploy-time, whenever I can. Being able to interject a step into your company’s deployment process might be a dream for some of us but that is what I am recommending. The method that I recommend is a pre-deployment step. For those of you using SSDT, this would be like a pre-pre-deployment step because I am referring to an exterior process that will come before the SSDT pre-deployment script. 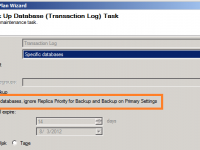 With Availability Groups specifically, we can take advantage of the dynamic management view sys.availability_replicas to identify the replicas in the group. This is useful because your deployers can push to the primary node, or the Availability Group Listener, and your scripts will still update all nodes without any form of hard coding. Below is a PowerShell script that I have used to deploy SQL files to the various nodes of my Availability Groups. First it will detect the nodes of the AG, and then spawn asynchronous jobs to deploy the server objects to each one. [string]$serverName - "The name of one of the replicas in an Availability Group"
[string]$availabilityGroupName - "The name of the availability group that you are targeting. Optional, if there is only one group." # If there is only one AG, then the object type will be System.String. # System.Object indicates multiple rows, so we need to look for the AG name from the input and purge other records. You can see, above, that I am calling a T-SQL file named DatabaseServerObjects-Deployment.sql. This is where all of the real work happens. I like to use the SQLCMD r: command to call smaller, more manageable scripts rather than one large script. I’d start with this directory structure. Then, use this T-SQL script to call the various pieces. Once that is all in place, you can call the PowerShell script as a pre-deployment step every time and your entire Availability Group will be in-sync across all replicas. did not see any .sql or .ps scripts.